Our Lady Eagles earned the second seed in districts this year, meaning they were taking on the seventh seed Thomas Jefferson. The Lady Eagles pushed the ball all throughout the game. They Lady Eagles pulled away from Thomas Jefferson in the second quarter. The final score for the first round of districts was 76-33. 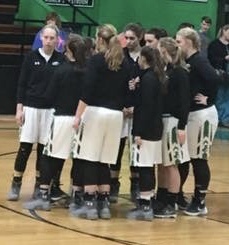 The Lady Eagles face College Heights Thursday, February 22, at 8:00PM in the semi-final match at Pierce City.